Welcome to another of the Bill’s History Corner where we discuss interesting topics concerning the people and history of the different Coppes companies. I found this receipt in the paper storage of the Coppes Commons collection. 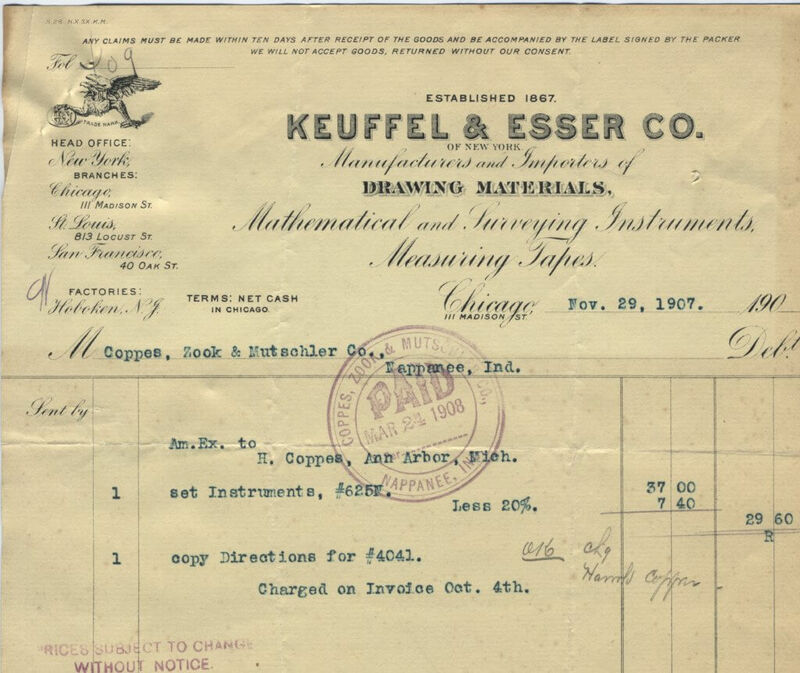 I think looking at this receipt closely will give you a better understanding of the volume of business that the Coppes Bros. & Zook co., Or the Coppes, Zook & Mutschler Co. did. This receipt is dated 3-31-09, so it is during the partnership between the Coppes Brothers, father, and son Dan and Harold Zook, and the Mutschler Brothers. In 1909 the company was operating a sawmill, a flour mill, wholesale & retail lumber sales and constructing many kinds of furniture as well as Kitchen cabinets. 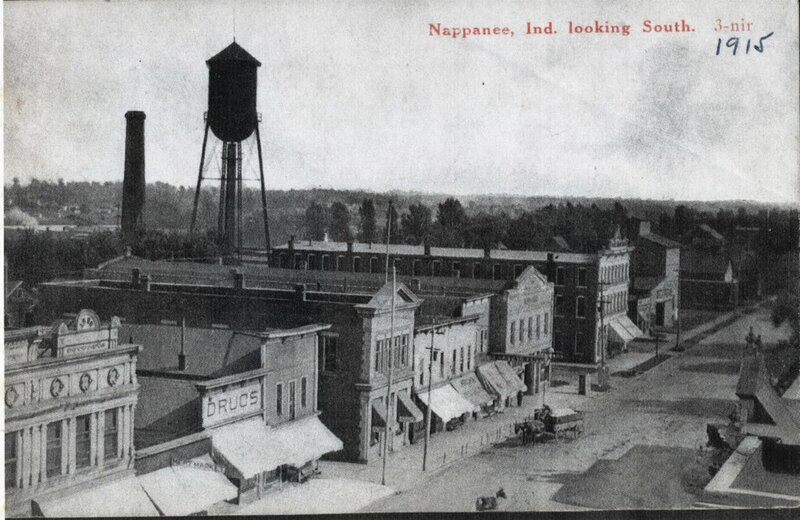 The Coppes Company was Nappanee’s largest employer. The Keeler Brass Co. Manufactured brass furniture trimmings and all kinds of hardware for furniture. This order is for pulls (drawer pulls), knobs, catches and then more knobs. 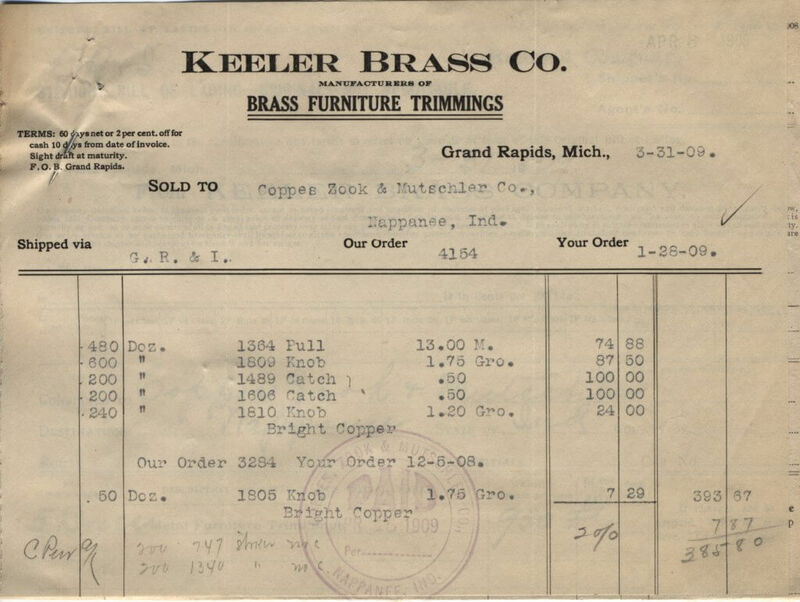 So, this one order to the Keeler Brass Co. is for 21,240 individual items, either knobs or drawer pulls or catches. That is a lot of drawer pulls or knobs. What we don’t know from this one receipt is how often they send an additional order for more hardware. Hello, welcome to this week’s History Corner. There is an important topic which I want to begin speaking about. That topic is the idea of putting another steam whistle somewhere on the outside of the Coppes Commons property and making it possible to blow the whistle. I personally do not remember the original Whistle that functioned at the Coppes factories, although I must have heard it many times in the 60s. From reliable sources, I understand that the Coppes factory whistle, which was two-toned, disappeared from the factory location approx. 15 years ago. 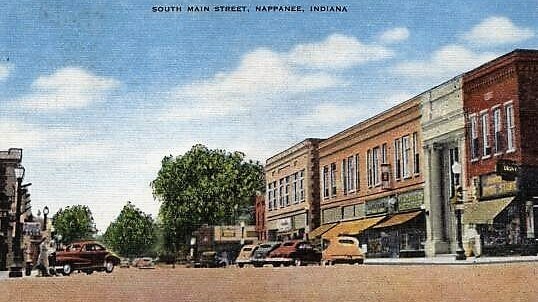 People who had an interest in Nappanee’s history were watching it, then it disappeared. So far no one has claimed ownership, though I guess ownership of a stolen item may be a bit sketchy. At least this has been the story that people have told me. We (I should say the owners of Coppes Commons and the Coppes Napanee Kitchen Factory) want to reintroduce the whistle to the factory, with the possibility of blowing the whistle at noon each work day and at special events. Here is where you can be of help. Please comment on this idea of reintroducing the whistle to Coppes Commons. Do you think this is a sound (pun intended) idea? 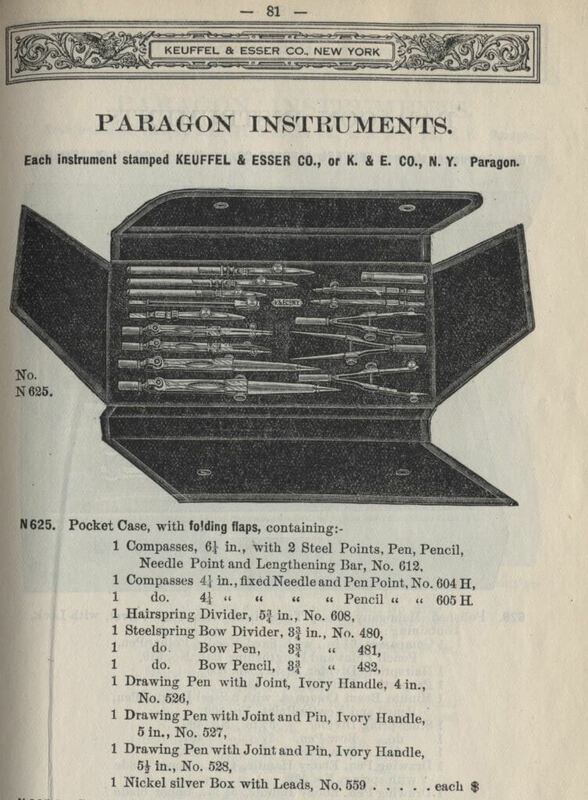 I found some drawings of whistles in an old 1906 tool & hardware catalog to give you a better idea of what I’m talking about. Sorry the book was too big to fit on my scanner, so the edge is cut off. 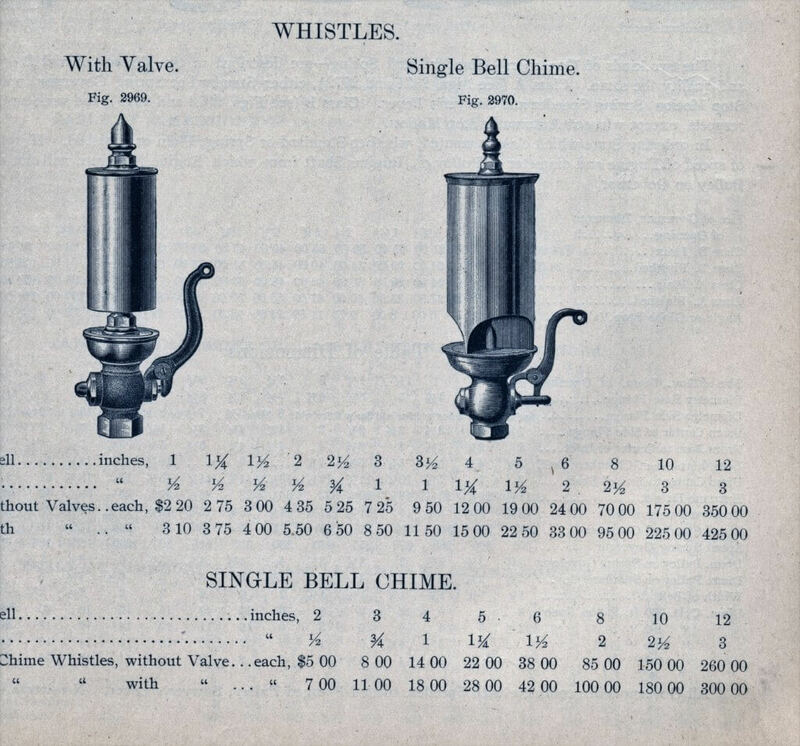 The part that is missing said “Diameter of bell” 2nd line was “Diameter of pipe” 3rd line was “Price, Whistles with-out Valves” and the 4th line was “Price, Whistles with Valves” These were 1906 prices, WOW. I wonder what distance you could hear one of these whistles. I was also thinking the larger sizes make the type of sound we readily associate with large ocean-going ships. While the smaller sizes make sounds associated with steam engines that we see and hear at tractor shows. Welcome to another in the series of Bill’s History Corner, where I try to explain or highlight an aspect of history as related to the old factory. Coppes Commons has had several different names, depending who the owners were at the time. Except at the very beginning of the company, the Coppes name was always the first name to appear. Such as the Coppes Bros. & Zook, or Coppes, Zook & Mutschler Co.
During the 1880’s, the three Coppes Brothers; Frank, John, and Samuel, were working together. This is also the time of possibly the most important developments in the company. The three brothers had been operating the sawmill along with wholesale and retail lumber sales. 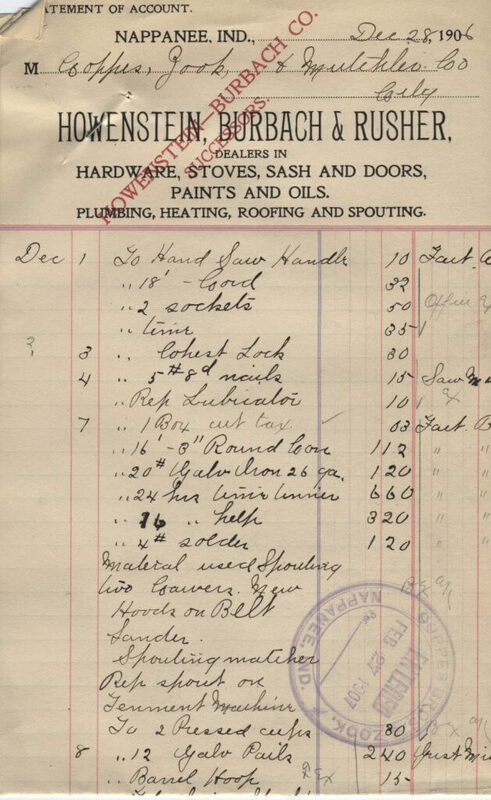 To this already full schedule, they added manufacturing building components, such as window sash & frames, doors and frames, and other building components. The shipping box portion of the company was expanded into a new brick building in 1883. They had such a large business they had two extra-large railroad cars built expressly for the transportation of the lightweight wooden boxes. 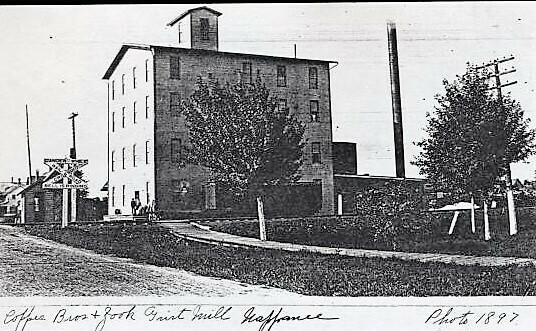 In 1887 the company built and began operating the Grist Mill on South Main Street. The town of Nappanee had tried for a couple of years to have a Grist Mill built in Nappanee. There was a need for this kind of business in Nappanee. Farmers were raising wheat locally but didn’t have a good steady market to sell their product. Before the Grist Mill was built farmers would most likely sell their wheat through middlemen who would come to town and offer to purchase what was for sale, usually at a lower price than what was being offered in the cities. Either sell to the wheat buying middle man or haul your wheat to Elkhart or South Bend. Neither choice was great. The pictures I want to highlight today are of the Coppes Bros. & Zook grist Mill 1897, ten years after it was begun. The first picture is of the loading dock with Coppes Bros, & Zook employees (this loading dock is still the one you can see today along S. Main). Several of the men obviously work closely with the finished flour as their clothing is more white than dark colored. I also see two hand carts, several full bags which could incoming wheat or other animal feeds such as “CHOP FEED” or “BRAN,” which was sold to local farmers. These bags are not likely milled flour, because as far as I know, the finished milled flour was bagged in 5, 10, and 24 ½ -pound paper bags. When the milled flour was sold in large quantities it was priced by the “BARREL”, which was 196 pounds. I wonder if the man to the right in the clean suit is one of the Coppes Brothers? And how did he keep his suite so clean? Notice the youngster on the right, is that his bike on the other end of the dock? Where have we seen youngsters with Bicycles in other Coppes pictures? The 2nd photo I want to highlight is also of the Coppes Bros, & Zook Grist Mill. This picture which was likely shot on the same day as the Employees picture (has the same date). It is looking South at the mill from ground level with the railroad tracks in the foreground. Some of the details I want to point out are that this is a four-story building with a cupola on the roof. There is a rail car beside the building for loading ground flour and shipping to distance customers. The power to drive the machinery comes from the boilers and steam engine in the low “engine house” to the rear, under the smoke stack. One side note is the fuel that was burned was mostly wood cut offs and scrap wood from the Coppes Bros. & Zook saw mill. I can imagine that it would take 2 men working full time to feed the lumber fuel into the boilers. A lot of hands-on labor in this business. You can see the small train track guard shack behind the crossed arms train crossing sign. You can’t see it this picture, but the first house South of the mill was built by the Coppes Bros. Zook for the dwelling of the “master miller” Mr. George Nold. Welcome to Bill’s History Corner, where I try to show some of the more interesting photos that we have in the Coppes Commons collections then try to explain as much as I can about the picture. Some of that explanation may be a guess on my part. If you have a different version, I want to hear your story. 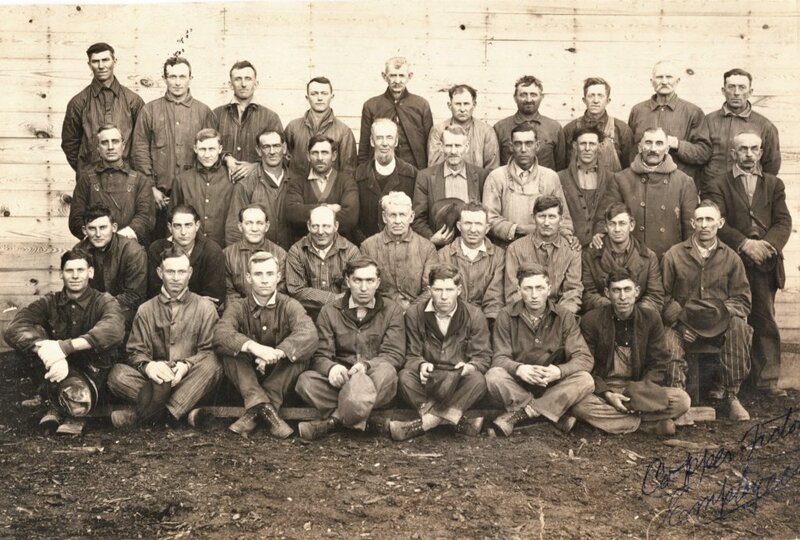 These 36 men in this photo are identified as “COPPES FACTORY EMPLOYEES.” Someone wrote that on the bottom of the photo with a ballpoint pen, and on the back side is a taped-on card with six of the men identified. Those names are “2nd row from back, 5thfrom left: Benjamin Miller, end: Harvey Kraft. Second row 4th from left: Sam Defreeze, 6th: Rufus Shank, 7th: Mr. Bleile, 9th: Chas Norris. Can you identify any more of these men? What can we determine from studying this photo? The first thing I notice is that these men are mostly dressed for outside cold working conditions. Everyone in the front row is holding his hat and several are wearing gloves. Most have their coats buttoned up to their necks and several of the men have a bulky sweater showing around the collar. I can almost guarantee you that every one of these men are wearing “long Johns” under all of that. There is a wide range of ages of men. The youngest may be in his early 20s, while the oldest appears past retirement age. Could men afford to retire during this era? Only one of the men is plain dressed, indicating Amish or Mennonite. There are several mustaches and a few unshaved faces in the group, but only the one beard. As for an estimate of the time period I’m going with 1890. 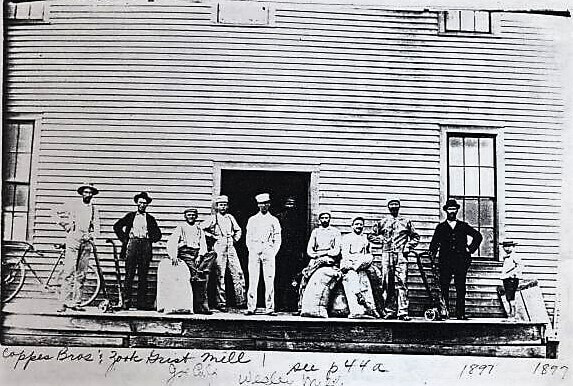 Here is the reasoning for my guesswork: I think the building that these men are posed beside is the recently-built second sawmill. At the time, it was located behind the Coppes Factory South of Lincoln St. Notice that the wood siding is still clean and not weathered, no weeds or grass on the new site. Work on constructing this sawmill was started in 1888. Most other Coppes Bros. & Zook buildings were brick. I think these men are the crews that worked in and around the sawmill. The other large group of Coppes workmen at that time were the men in the Box factory. This was all inside work, so I think they would be dressed differently. I think this group of men worked in the sawmill where sawdust was flying. They probably also moved logs to the mill and stacked the lumber after it was cut so it could air dry – hard work for everyone. Another possibility is a couple teamsters in the group, but I don’t see anyone dressed differently. What do you think? 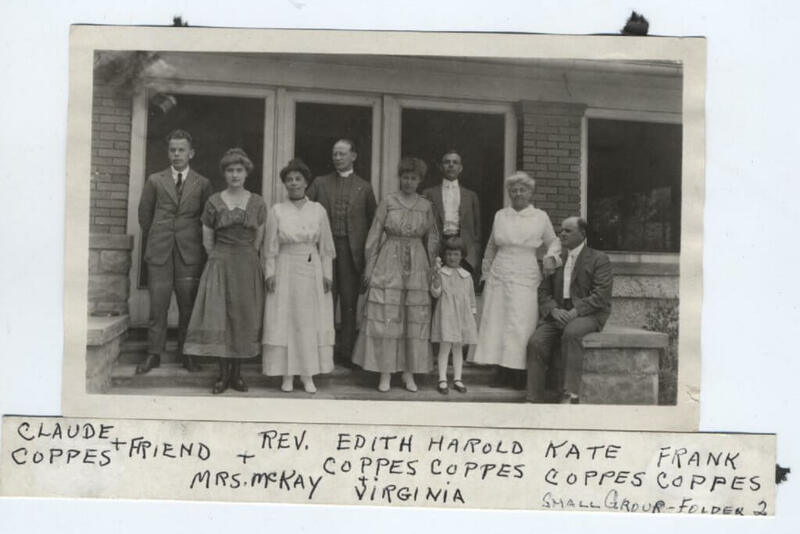 Hello, Today for Bill’s History Corner we are looking at a porch scene with the family and guests of Frank Coppes posed for a group picture. I’m imagining a casual Sunday dinner with guests, likely something the Coppes families did often. I’m putting a date of about 1914-16 for this photo, and I’m basing that guess on the only child in the picture. Young Virgina (daughter of Harold & Edith) was born April 13, 1911. In 1917 a second daughter was born to this couple, and because the 2nd child is not in the picture, this photo likely was before 1917. Also, Claude Coppes has a lady friend with him, meaning he was not married at the time of this picture. Claude married Harriett Star on May 14, 1918. You know me, I’m curious about everything. So, I’m wondering how there just happened to be someone with a camera in the vicinity able to take this picture and provide a print to the family. Or, did Frank hire a photographer to be there with a camera setup? Wonder what day to day life was like for the children of the most famous family in Nappanee? If I’m correct about the date of this picture, Frank & Kate would have been 58 & 57 years old, Harold was 30, and Claude was 26. Under the direction of the president of the company, Frank Coppes, the business at the Coppes Bros. & (Harold) Zook Company was beginning to explode. The partnership with the Mutschler Brothers had dissolved approx. 2-3 years earlier and the Coppes Bros. & Zook Co. was setting up the company to manufacture kitchen cabinets exclusively. The sawmill and flour mill continued to operate as it did before the partnership. 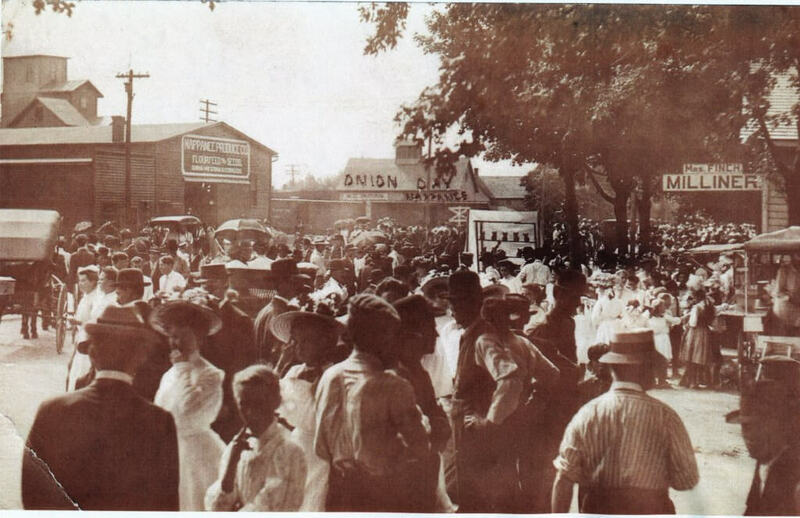 This interesting photo like so many others was shared by the historical collection at the Nappanee Center. I don’t know about you, but I love old pictures. I guess that is the reason you see so many in the history Corner. I keep thinking of the old saying, “a picture is worth a thousand words.” Today I have four pictures for you to look at. Maybe you will see some detail I missed. We have already looked at pictures of the East side of South Main Street. Today I am showing the West side of South Main. 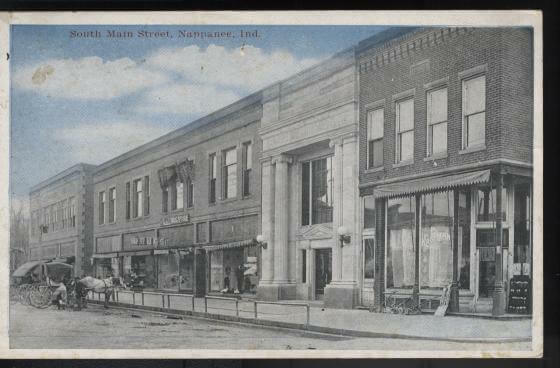 South Main has always been the heart of the retail center of Nappanee. I’m not going to even try to name all the different stores and businesses that were located on South Main. The pictures I have to show you span approximately 50 years. 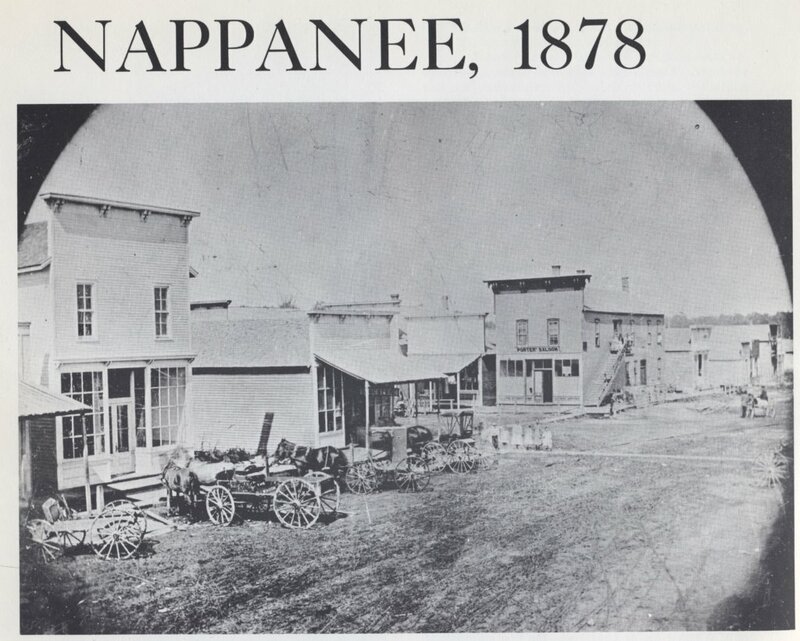 Starting with a picture from the Book “THEY CALLED IT NAPPANEE, A HISTORY 1884-1974.” This is a great book put out to celebrate Nappanee’s centennial. I know that I have learned a lot reading this book. 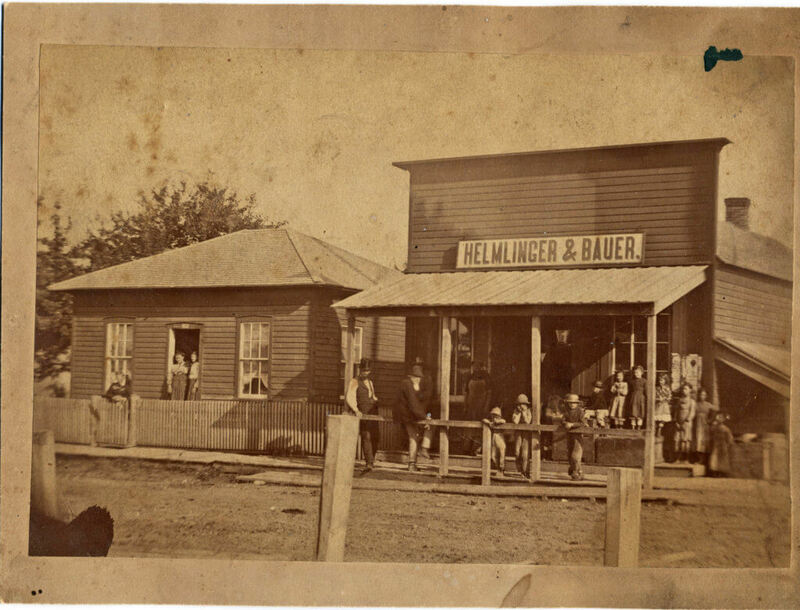 The first picture has the title, Nappanee, 1878. 1878 is just a couple of years after the town was platted. 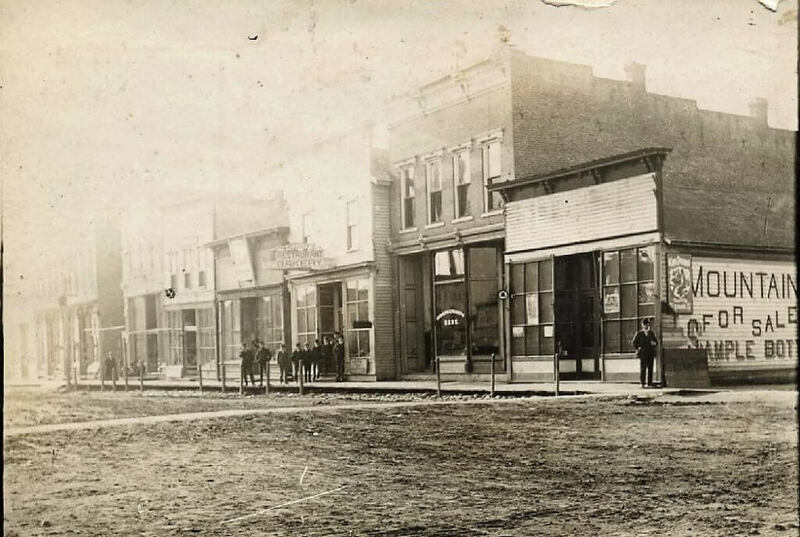 This picture has the camera pointing north looking at the buildings on the west side of Main Street and the intersection of what is now Market and Main Streets. Porter’s Saloon is the large building on the northwest corner. Notice the outside stairway leading to the “Auditorium”. This building has had many different businesses located inside. Hardware stores, (someday I want to do a study about Nappanee’s various hardware stores) this saloon, a public school, and a place for stage shows. Along South Mai,n the first building next to the intersection was originally the shoe and broom shop of Dan Metzler. In this picture you can make out the “DRUG STORE” sign under the covered walkway. This drug store was the business of a Mr. Lake who moved his store inventory from Locke to Nappanee. Dan Metzler was one of the three neighbors that platted the town on Dec. 12, 1874. His “Broom shop” was the first shop/store in the area that would become Nappanee. Next to the broom shop is an empty lot. I will be talking about this location later. The next building appears to be empty but would make a very nice general store for someone. Notice the buggies in the street and the five little girls and one boy standing on the boardwalk, keeping perfectly still to have their images recorded in this historic photo. Picture number two is also of South Main but from a different direction. You’ll notice that now the cameras is located in the intersection and is pointing more to the south and we can see all the buildings in the first half block. Again, we have a number of people, men or boys this time, lined up for their 15 minutes of fame in front of the building that has a “Restaurant – BAKERY” sign out front. Too bad they didn’t tell the photographer their names. Any guesses as to the word following MOUNTAIN ________? Could it have been “Tonic,” As in Mountain Tonic – For Sale here – sample bottle free. I’m thinking that we will never know, unless the newspaper had started by the time this picture was taken and the store did some advertising. The Nappanee Weekly News was first published on March 27, 1879, so maybe there is a chance we could find out. The empty lot that I mentioned in picture one is now the FARMERS & TRADERS BANK. This is the first version of the building, not what we know today. In approximately 1917 a new stone front with columns was added. This bank is the one that Samuel Coppes purchased in March, 1891 after he left the Coppes Brothers partnership company. Samuel purchased the bank from Mr. Daniel Bechtel and Son. I don’t think I have ever thought of it before this, but what do you actually purchase when you purchase a bank? Does the purchaser get the building & solid contents, along with the bank’s name and reputation? What about the customers’ accounts, and the safe deposit boxes? What is your guess as to the time of the year that this picture was shot? About the only indicators I can see are the clothing being worn and the condition of the dirt in the street. What do you see? 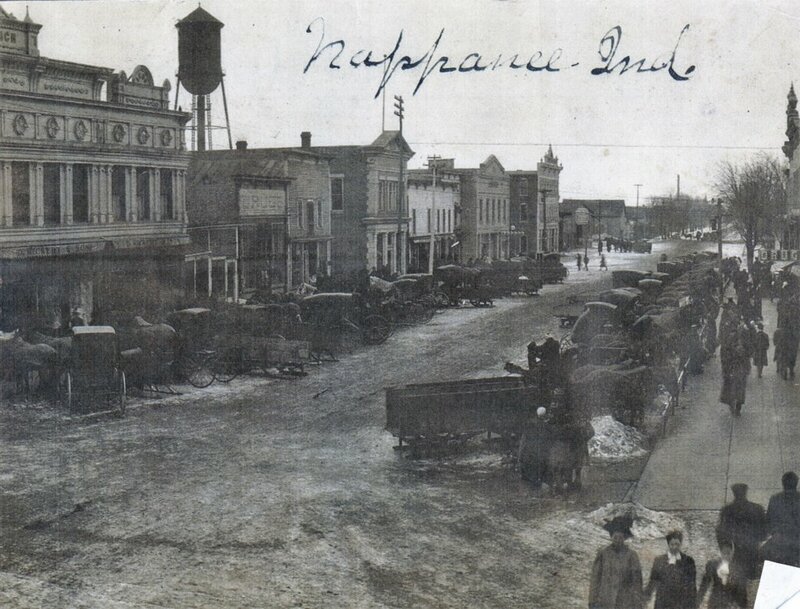 Picture number three is a postcard with the title “SOUTH MAIN STREET, NAPPANEE, IND.” A whole lot of construction has taken place on South Main Street. This is after 1917, because of the new bank front, but also notice the new brick building on the corner. Most everyone knows this building as JOHNSON’S DRUG STORE. An item in the Dec. 23, 1908, Nappanee Weekly News has this title, “FIRST TO OCCUPY NEW BUILDINGS. COPPES PHARMACY OPENS DECEMBER 31. AN EXTRA FIND OUTFIT.” It seems that John Coppes built this building with the intention that his son Marvin would operate it in a positive manner. Marvin Coppes had recently graduated from Purdue with a business degree. The newspaper goes on to describe the building’s fine interior woodwork and fixtures being manufactured by the workmen at Coppes, Zook & Mutschler. Also, the door with “side panels and fancy lamps shades” were mfg. by the Geo. L. lamb factory. Beyond the bank building in what were four separate buildings, there is now one brick exterior covering the fronts of all of them. Beyond the alley is the Hartman’s store. Please notice that at this late date there were still railings to tether horses and not automobile parking spaces. Here is another picture (color) postcard of the same South Main St., likely from the 1940s by the shape of the cars. Not much has changed with the buildings. The greatest change is because of the automobiles. New sidewalks with car parking and street lights to make it convenient for customers to get into the stores and buy something. For this week’s History Corner, we are looking at three early pictures of the east side of South Main Street. The first photo was copied from a postcard and is dated 1915. The street had been paved with brick just five years earlier in 1909-10. Both sides of the first block between Market St. and Lincoln St. were filled with businesses. There were two banks, Hartman’s department store, and drug stores, etc. The block was full of buildings, several having second floor offices above the 1st floor business. At the Southeast corner of Lincoln St. and S. Main was the Nappanee Carriage Company building, an imposing three-story brick building with the city water tower and power station behind. On farther south is a grain mill and the railroad tracks. The long building shadows that show up on the street tells me this picture was taken late in the afternoon when there was very little traffic on the street. I only see one horse and wagon with a load of what looks like grain. Also, notice the window awnings on most of the east side buildings. It appears that there are trees with leaves in the background, so this may have been during the summer or early fall months. Do you see the thing that looks like a gas pump? Well, that is what it is. The next photograph doesn’t look like the same street – so many buggies, wagons, sledges, hardly a parking place left. It looks really cold with ice on the streets and people in heavy coats. Were the people in town for Christmas shopping or was this a typical busy Winter Saturday? Wouldn’t it have been great if someone had written the date on this picture?! Next week we will look at the West side of S. Main.